Typically used to provide strength after a root canal treatment or to cover a heavily filled, decayed or broken tooth, crowns are custom-made prosthetic fittings that are cemented onto your existing tooth. Traditional metal-based crowns have long been used to strengthen or rebuild teeth – but nowadays porcelain and pressed ceramic crowns provide a completely metal-free and aesthetically-pleasing option. Engineered in a lab using your dental impressions, they will match the exact colour, texture and translucency of your natural teeth. The latest generation of ceramic crowns are excellent in terms of strength and function – especially at the front of the mouth, where aesthetics are of paramount importance. Unlike the crowns of yesteryear, the ceramic crowns provided at Binley Woods Dentistry have no metal lining, so you won’t notice any dark lines or shadowing at the gum line. Because there is no metal under our ceramic crowns, they are more lifelike and reflect more light – making them appear even more natural. They’re bio-compatible too, so there is no risk of allergy to the metal alloys found in traditional crowns. Want to know more? Give us a call on 02476 540 045 or click here to book online and get a FREE CONSULTATION! Fitting a crown usually requires two sessions at Binley Woods. 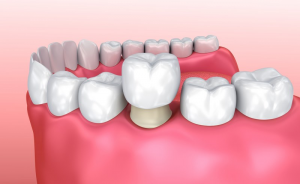 To prepare your tooth for a crown, the dentist will first file it down to a smooth, conical shape that will perfectly accommodate the restoration. When this is done, the dentist will take impressions of your teeth, which will be sent to a dental laboratory. You will be fitted with a temporary crown while your custom fitting is being engineered; when it’s ready, your dentist will cement it in place using a special curing light. Modern crowns can be engineered to match the exact shade of your existing teeth, and come in a variety of materials, including ceramic, resin and porcelain fused to metal. Gold and steel are still worth considering if you want an extra-strong crown for your chewing teeth. Your dentist at Binley Woods will talk you through all the options available before you go ahead with treatment. No – the preparation is carried out under a local anaesthetic. If you feel at all nervous about having a crown fitted, don’t hesitate to speak to the team at Binley Woods, as we have a range of options in place to help anxious patients feel calm and relaxed during treatment. Generally, a crown will last around 10 years – but if you take care to practise good oral hygiene, you’ll keep your crown for longer.